Every year, between Pentecost and the Sunday after Thanksgiving, the lectionary takes us through week after week of “Ordinary Time,” a seemingly endless stretch of Sundays in green during which there are few special celebrations, no Advent or Lenten introspection and expectation, no thrilling Christmas, Easter or Pentecost celebratory remembrances, just a bunch of green week after week after week. A friend of mine once claimed that Ordinary Time is her favorite part of the liturgical year. I told her she was nuts. But I’ve learned over time to appreciate Ordinary Time. Each year, for instance, the gospel readings during Ordinary Time take us through one gospel writer’s version of Jesus’ adult ministry–this year it has been John, but my favorite is Mark. I like Mark’s style–he’s brief, direct, and to the point. One week, Jesus calms a stormy sea with a simple “Peace, be still.” Another week he raises Jairus’s daughter from the dead. Another Sunday, he not only heals people and casts out demons, but he also empowers his disciples to do so. The religion I was raised in explained some of this by dispensational theology, meaning that the dispensation of miracles, for some unexplained reason, ended with the coming of the Holy Spirit at Pentecost. Now that we have the Holy Spirit and the Bible, apparently miracles are old hat. I don’t buy it. But a stroll through the gospels raises the complications of miracles for me in a new way. While riding in the car not long ago, Jeanne and I talked briefly about what it must have been like to be with Jesus and witness the miracles. How could anyone who observed such events have been as confused and often unbelieving as the disciples apparently were? Were the miracles daily events? Or does it just seem that way because the gospel writers are only hitting the high points, Jesus in miracle-working mode? Maybe the gospel versions of Jesus’ ministry are like a ninety-second trailer for a movie. The trailer makes the movie seem like a “mus see,” but when you see it you find out that the only funny, dramatic, or poignant parts are the moments you saw in the trailer. Maybe life with Jesus during his ministry involved lots of down time with a few high points. Just when you think you’ve got this guy figured out and have rationalized an explanation for what must have happened when he calmed the sea several weeks ago, just when you’ve decided that he’s a very interesting and charismatic guy but nothing more, then he randomly raises someone from the dead and the confusion starts all over again. The real confusion for me, I think, if I had been a disciple comes into sharp focus as Mark’s gospel proceeds and he tells the story of the capture and beheading of John the Baptist. If there’s anyone who deserves a miracle from Jesus, it’s his relative John. John’s whole ministry was to “prepare the way” for Jesus, to connect Jesus to Old Testament prophecies, to baptize Jesus, to identify him as “the Lamb of God who takes away the sins of the world,” then to step back. 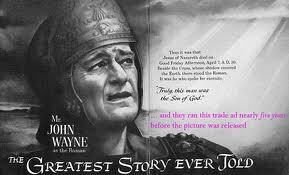 But John has a big mouth; he runs afoul of paranoid and crazy Herod Antipas and finds himself in prison. How hard would it be for Jesus to open the prison and set John free? Jesus wouldn’t even have to be there—he could have done it from a remote site, sort of like a first century wireless connection. 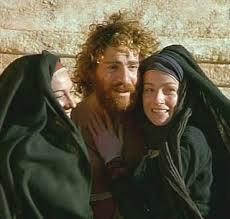 But Jesus doesn’t work that miracle or any other, and John’s head is soon presented to Salome on a platter. The randomness of the miracles must have struck Jesus’s followers then as powerfully as their apparent absence strikes us now. Miracles were no more predictable or formulaic in Jesus’s day than they are now. I suspect this is one of the reasons Jesus frequently used to tell those who received or observed miracles not to tell anyone (a directive that was usually disobeyed immediately). Following Jesus in the flesh would not have clarified the miracles confusion any more than following Jesus now. So the question remains—what to do about the miracles (or absence of them)? A recent rereading of Marilynne Robinson’s beautiful novel Gilead reminded me of a much healtheir and less stressful space concerning miracles, a space that I’ve begun learning to occasionally occupy over the past few years. In Gilead, a rural Congregational minister in his late seventies is writing a memoir for his young son, an only child unexpectedly born to Rev. Ames and his much-younger wife when Ames is seventy. It has seemed to me sometimes as thought the Lord breathes on this poor gray ember of Creation and it turns to radiance–for a moment or a year or the span of a life. And then it sinks back into itself again, and to look at it no one would know it had anything to do with fire, or light. . . . But the Lord is more constant and far more extravagant than we think. Wherever you turn your eyes the world can shine like transfiguration. You don’t have to bring a thing to it except a little willingness to see. Only, who has the courage to see it? Good question. It takes a lot more courage to embrace this world with all of its imperfections and disappointments as a spectacular and continuing divine miracle than to step back and bemoan the fact that it seldom is the miracle we would have performed if it were up to us. It isn’t up to us—the power and glory of our created, sacred world is far above our pay scale. Every week at my Episcopal church during the prayers of the people, the leader says “We thank you for all the blessings of this life. This week we are especially grateful for (individuals share personal thanksgivings).” It is always striking how few of us share our personal thanksgivings. Often at that point of the prayers, I often flash back over the week just past and conclude quickly that “nothing special happened.” That’s the attitude of someone who is unaware or chooses to be ignorant of the fact that everything is a blessing, that it’s all a miracle. This entry was posted in baptism, beauty, Bible, Christianity, dogs, Episcopal, faith, family, Holy Spirit, Jeanne, literature, liturgy, love, miracles, movies, mystery, peace, power, prayer, Religion, Simone Weil, theology and tagged Bible, family, God, Marilynne Robinson, miracles, prayer on October 25, 2017 by vancemorgan. Jeanne and I watched a documentary not long ago called “Fierce Light: When Spirit Meets Action,” created, filmed and directed by a man with the fabulous name “Velcrow Ripper.” He is the cousin-in-law of a colleague and friend of Jeanne’s who made the recommendation. 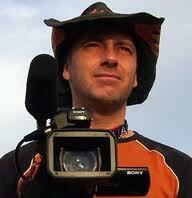 The movie was beautifully constructed and filmed, as well as being very thought-provoking. The central thread of the documentary traces various ways in which people seek spiritual growth and reality that are seldom located in traditionally religious frameworks. All this, of course, in the middle of a world that seems to have little concern for matters of the spirit at all. The voices of spirituality, religion, secularism, materialism, power, and greed often are speaking languages so incompatible that our world appears to be little more than a cacophony of white noise at different pitches. 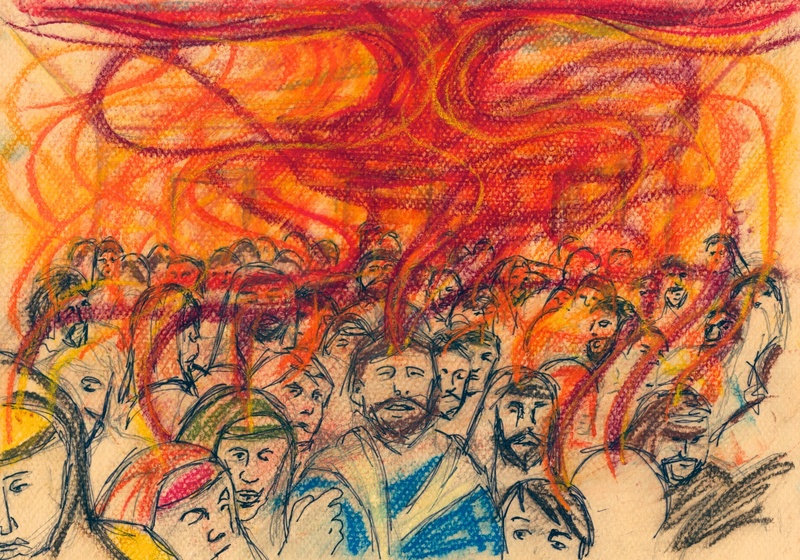 The Old Testament reading for Pentecost tomorrow is a story that is familiar to many but has probably been actually read by few. 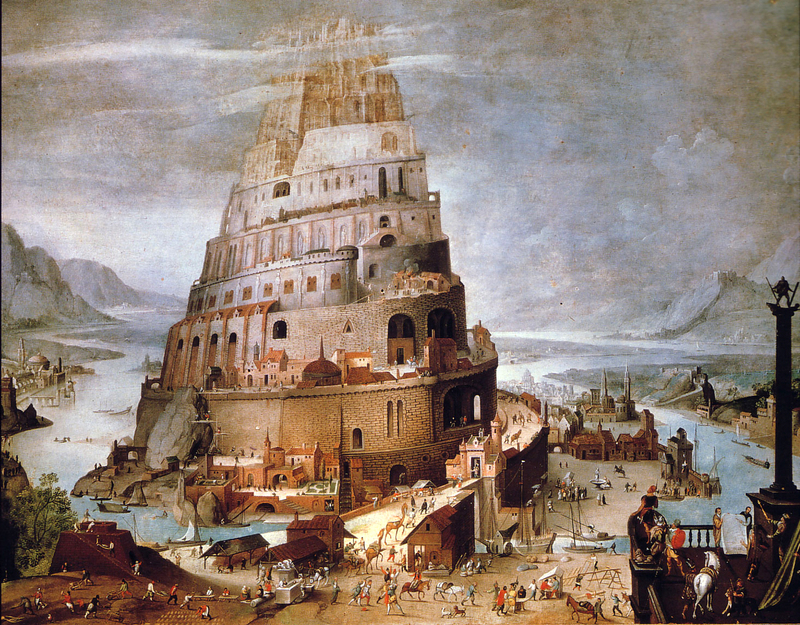 The Tower of Babel tale was part of the first seminar assignment (Genesis 1-25) for one hundred or so freshmen last fall in the interdisciplinary course I teach. These chapters contain stories so seminal and formative—creation, the Garden of Eden, Cain and Abel, Noah and his ark, the call and adventures of Abraham—that it is impossible to do them all justice. So I didn’t try. Instead, I focused our seminar attention on the strange story in Genesis 11. Very briefly, it is traditionally interpreted as a story similar to Noah and the flood—human beings are getting uppity and God puts them in their place. Because of their hubris, God scatters people in every direction as well as “confusing their language” so they can no longer understand each other. Just as we can blame Adam and Eve for original sin, so our seeming incapability of understanding or truly communicating with each other is inherited from the people of Babel who thought themselves to be greater than they actually were. Reading this story anew with my students last fall, however, revealed something far more interesting and provocative. First of all, there is no obvious challenge to God from the people of Babel. What they want to do is build a city, share their talents, build a tower as tall as their abilities and technology will allow, settle down, stop wandering, and “make a name for ourselves—otherwise we shall be scattered abroad upon the face of the earth.” In other words, this is a story about the early beginnings of what we recognize as civilization. Recognizing that the world is a demanding and scary place, human beings learn that there is strength and security in cooperation and numbers. Self-reliance and independence are better established collectively than individually. There is no obvious sense of humans thumbing their noses at God here, just a desire to reap the benefits of community. So what’s the big deal? From the perspective of Elohim (the plural name for God used in this story), apparently this is a very big deal in a negative sense. Something about human attempts at solidarity, independence and strength is threatening to God throughout the Old Testament, but never more so than in this story. “This is only the beginning of what they will do; nothing that they propose to do will now be impossible for them.” These amazing creatures that we made? Look at what they can do! Planning, creativity, cooperation, independence, ambition—the sky’s the limit! Great stuff, right? Our kids are growing up! Divine high fives all around! Not exactly. “Come, let us go down, and confuse their language there, so that they will not understand one another’s speech.” Someone’s sounding threatened and paranoid. At the very least, the Tower of Babel story reveals that human progress by its very nature creates tension with what is greater than us. This particular God, sounding like somewhat of a control freak, is made uneasy by the prospect that what has been created might actually have a mind and will of its own. These are the early seeds of tension between the secular and the sacred. The divine response? Put an end to it now. Scatter them, confuse them, cut this thing off at the knees. Not surprisingly, when I asked my seminar students to reflect in their journals on the question “Did God treat the people of Babel fairly?” they unanimously judged that God did not. Toward the end of the semester, as we moved into the New Testament for a couple of weeks, the seminar assignment was the Gospel of Luke, the Book of Acts , and Romans. What, among the vast array of possibilities, to focus on? 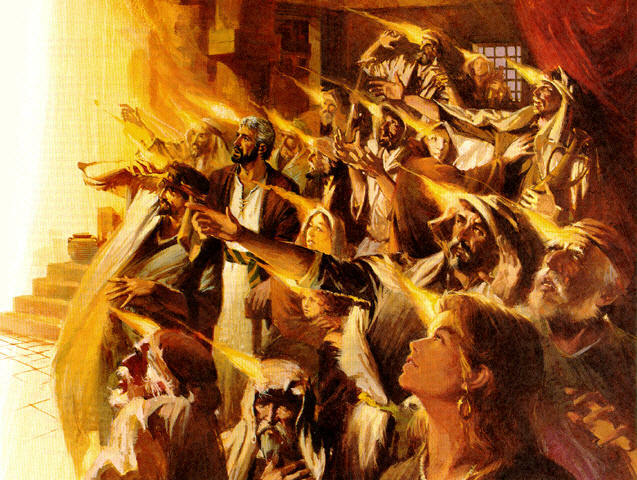 In preparation it occurred to me, as it occurred independently to several students in seminar, that there is far more than simply a surface level connection between the story of Pentecost in Acts 2 and the Tower of Babel story in Genesis 11. 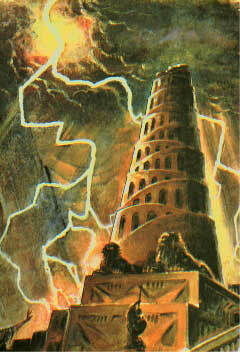 In fact, Pentecost undoes Babel, turns it on its head. Rather than dispersing human beings and confusing their language, at Pentecost the divine unites human beings by causing them to understand each other. This entry was posted in Big Bird, Christianity, God, history, Holy Spirit, human nature, incarnation, Jeanne, Marsue, miracles, movies, power, Religion, stories, teaching, theology and tagged God, marsue harris, Old Testament, religion, St. John's Abbey on June 3, 2017 by vancemorgan. Or, someone might add, show me where it says “liturgy” or “dogma” or any number of other things that are staples of Christian tradition even outside Catholicism. I have no idea whether Mantel’s characterization of Cromwell and More is accurate (neither does she, for that matter), but I am so strongly aligned by nature with fictional Cromwell in this passage that I share his utter astonishment with the fictional Mores among us. 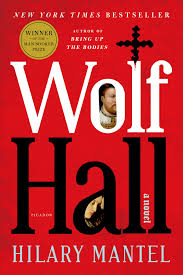 Wolf Hall is set during the early decades of the sixteenth century when the revolutionary impact of the Protestant Reformation is already making itself known in England. Thomas More is the epitome of religious certainty, imagined by Mantel as a vigorous, devout, hair-shirt-wearing and frequently inflexible defender of Catholic orthodoxy. Although Cromwell rises to influence as the right-hand man of the powerful Cardinal Wolsey, he is far more comfortable with situational flexibility than with pre-established beliefs and principles. 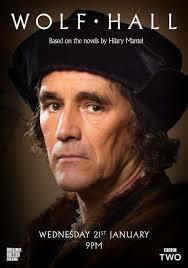 When Wolsey falls from grace because of his failure to facilitate the king’s desire to divorce Catherine of Aragon in order to marry Anne Boleyn, Cromwell’s ability to quickly adjust to changing circumstances and maneuver creatively brings him into the king’s inner circle. But he always keeps the Mores of his world in view, simultaneously envious and wary of anyone’s unflinching commitment to principle. It is why every single expression of faith is provisional—because life carries us always forward to a place where the faith we’d fought so hard to articulate to ourselves must now be reformulated, and because faith in God is, finally, faith in change. I am frequently reminded in a number of ways by various Mores that a Cromwellian embrace of change is dangerous in that it leads to the brink of the worst of all abysses, a relativistic world with no absolutes and no fixed points. I admit that it can be disconcerting to find that one’s most reliable cornerstones have crumbled or shifted, but I have learned to find stability in commitment rather than in content. Within the well-defined banks of commitment to what is greater than us, the river of faith sometimes flows swiftly, sometimes pools stagnantly, and always offers the opportunity to explore uncharted waters. The terrain of commitment looks very different from various vantage points, and in my experience seldom provides confirmation of what I have believed in the past without change and without remainder. This is Christianity’s strongest feature: it tirelessly provokes its members to object to prevailing doctrines without having to abandon the faith . . . Neither Christianity nor any of the great religions has ever been able to successfully erect barriers against the dreaded barbarian incursions of fresh ideas. One of the things I’ve learned over the past few years is to stop criticizing or belittling those who build their belief systems in the manner of More, shaping all new experiences and information in the image of their most fixed and unchanging commitments. There are a number of Mores among my friends and family, and I’ve learned not only to appreciate them (usually), but find myself occasionally envying them. But at heart I’m happy being Cromwell as I watch the corners get knocked off my certainties. This entry was posted in Bible, books, faith, family, friends, God, history, human nature, Jeanne, Jesus, literature, movies, Religion, stories, television and tagged books, family, God, Henry VIII, Jeanne, religion on April 26, 2017 by vancemorgan. In the liturgical year, the last Sunday of Lent focuses on Jesus’ signature miracle–the raising of Lazarus. Hearing it read yesterday made me nostalgic for various Hollywood treatments of Jesus’ life from my youth. During my childhood, we did not go to movies—that was something, along with a bunch of other things, that good Baptists didn’t do. But we did watch television— except on Sundays. So my brother and I occasionally saw movies on television, after careful censoring by my parents. We always looked forward to the weeks leading up to Easter with great anticipation—not because it was Lent followed by Holy Week (I never even heard of Lent until I was an adult), but because that was when the networks might be showing Hollywood epic treatments of stories either from or related to the Bible: “The Ten Commandments,” “Ben Hur,” “Quo Vadis,” “The Robe,” and others. 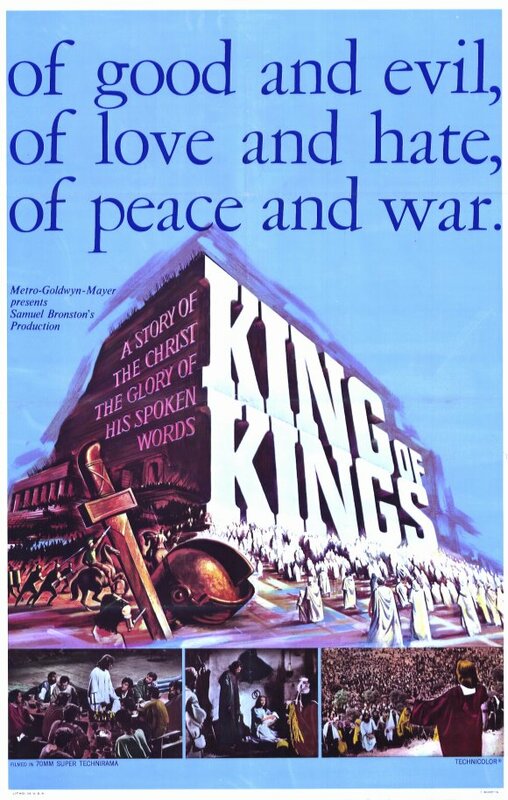 Particularly favored was “King of Kings,” a full-blown life-of-Jesus movie. These movies, despite their questionable accuracy by King James Version standards, were guaranteed to be approved by the parental censors. My mother, brother, and I popped popcorn and watched the Bible come to life in living black-and-white. 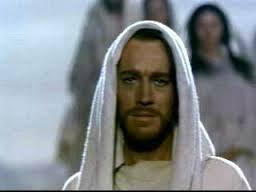 Then in 1966, when I was 10 years old, United Artists released “The Greatest Story Ever Told,” one of the last of the great Hollywood biblical epics, directed by George Stevens. 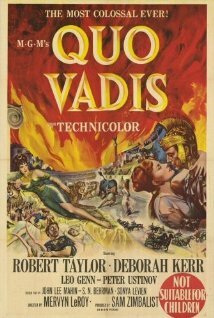 The cast was full of current as well as up-and-coming stars, included Max Von Sydow, in his first English-speaking role, as Jesus; Biblical epic superstar and future president of the NRA Charlton Heston as John the Baptist; Claude Rains, i n his final movie appearance, as Herod the Great; Martin Landau, the master of disguise in the “Mission: Impossible” of my youth, as Caiaphas; Telly Savalas of “Kojak” fame as Pontius Pilate, David McCallum (formerly one of the stars of “The Man from U.N.C.L.E,” currently starring as Ducky in “NCIS”) as Judas Iscariot; and my favorite: John Wayne as the Centurion at the foot of the cross, who delivers his one line—“Truly this man was the son of God!”—with all the sensitivity of a cowboy. Stevens’ directorial choice is to hinge the whole three-hour-plus spectacle on the raising of Lazarus, which takes place just over half way through the movie. It is a remarkable piece of cinematography—instead of focusing on Jesus and Lazarus, the camera focuses on the reactions of those present. Shocked faces, stunned silence, a woman drops to her knees, a man bursts into tears. One witness runs down the road, grabbing random people and sharing the news—“Jesus of Nazareth . . . I saw it, I saw it with my own eyes! 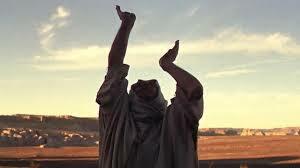 Lazarus was dead, and now he’s alive!” “The Messiah has come! 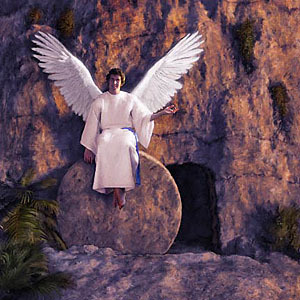 A man was dead, and now he lives!” And indeed this is a blockbuster miracle, worthy of a predictable Hollywood musical effect, the rapturous singing of the final measures of the “Hallelujah” chorus from Handel’s Messiah in the background. As the witness nears the walls of Jerusalem, he is joined by two men healed by Jesus earlier in the movie: “I was crippled, and now I walk!” “I was blind, and now I see!” “Who has done this?” shouts a Roman centurion from the walls of the city. “The Man Called Jesus!” Remarkable. Astounding. But the gospel text is very puzzling, raising more questions than it answers. If this is, indeed, Jesus’ signature, career-defining miracle, why is it only reported in one of the four canonical gospels? Why do Matthew, Mark, and Luke not consider the story important enough to include in their accounts? Why does Jesus deliberately delay travelling to Bethany upon hearing that his friend is deathly ill, dawdling along the way in order to ensure that Lazarus is dead by the time Jesus arrives? What exactly is the depth and nature of the Jesus and Lazarus friendship? We know a lot about Jesus with Lazarus’s sisters Mary and Martha, but this is the first time we’ve heard about Lazarus. Is he the domineering older brother of Mary and Martha, or the spoiled younger brother on whom they dote? Why does Jesus weep? 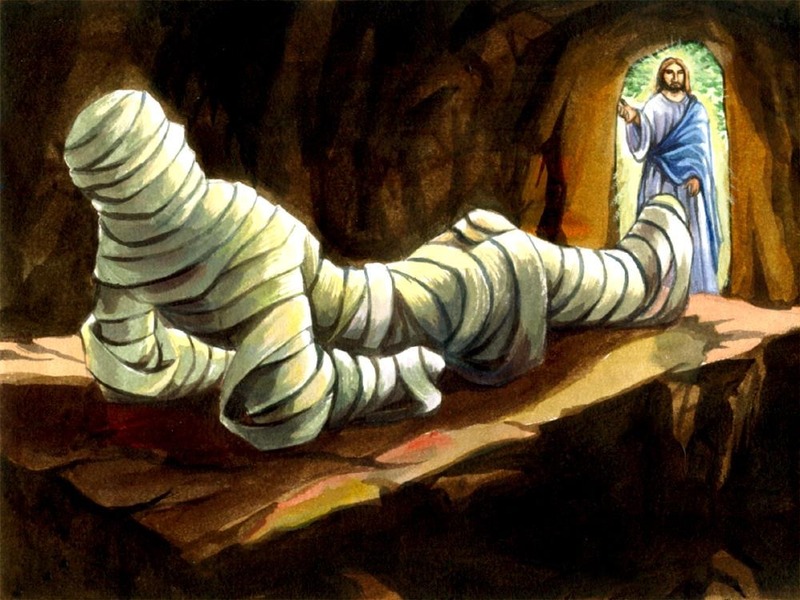 And why is Lazarus still wrapped in his grave-clothes when he emerges from the tomb? The gospel author mentions Lazarus only one other time, in the next chapter just before Jesus’ triumphal entry into Jerusalem. The crowds around Jesus have increased exponentially, as much to gawk at Lazarus as to see Jesus. The chief priests, plotting behind the scenes as always, plan to see both Jesus and Lazarus dead—this time there won’t be any resurrection. And Lazarus dissolves into our imaginations. What happened to him? How did he live out the rest of his life? These are questions worthy of discussion, as are the questions raised by the account of the miracle itself. 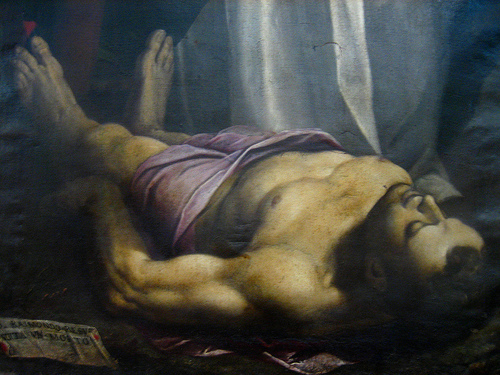 But Lazarus is not a museum piece to be dusted off and talked about once in a while. The story of Lazarus is our story, the story of everyone who seeks, in individual and unique ways, to be friends with Jesus. In the liturgical year, the story of Lazarus is accompanied by the prophet Ezekiel’s vision of valley of dry bones in the Hebrew Scriptures. 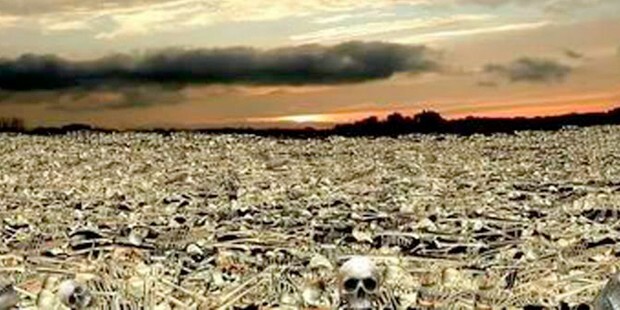 We all, I suspect, have spiritually experienced a valley of dry bones season. 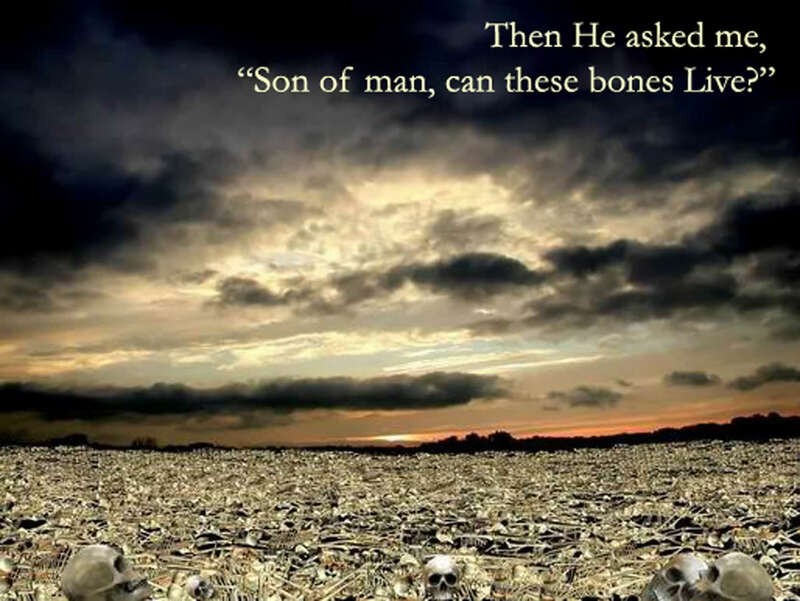 Dry bones are the remaining evidence of something that was once alive, but hasn’t been for a long time. 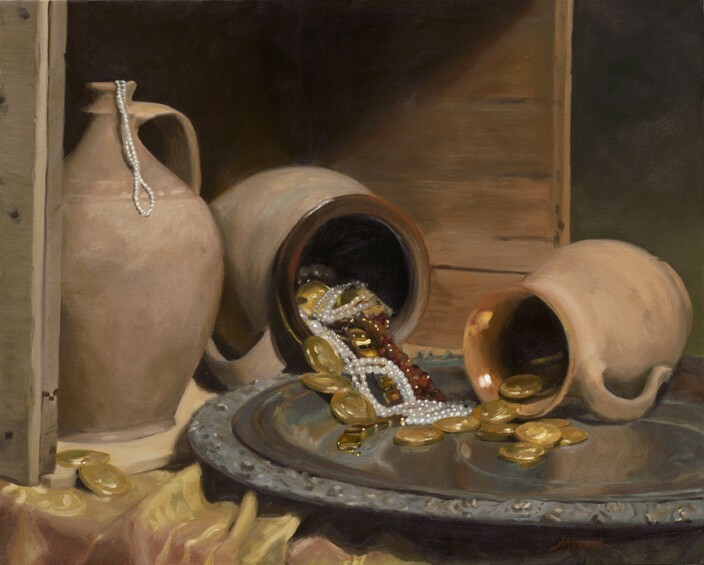 Lazarus in the tomb is well on his way to becoming a pile of bones—“Lord, already there is a stench because he has been dead four days.” Here’s how this sort of experience, a season of dry bones. goes for me. I’ve been raised to new life—so why am I still bound by the vestiges of death, by the grave-clothes of a past that I thought was gone? Because spiritual renewal and growth are like the Darwinian evolutionary process—I drag the remnants of a past reality into my new life. Vestiges of what has died still remain. If inattentive, I will attempt to weave new garments of salvation out of old, stinking, rags that have long outlived their purpose. And I cannot remove them by myself—I need help. We need each other’s help. I need the help of those who love me and who know what it’s like to try to get one’s bearings as a newly resurrected corpse. And the Lazarus cycle goes on. This entry was posted in Angels, Baptists, Bible, change, Christianity, faith, family, God, Jeanne, Jesus, miracles, movies, music, prayer, Simone Weil, stories, wonder and tagged angels, Christianity, Dietrich Bonhoeffer, faith, family, Old Testament, prayer, Simone Weil on April 3, 2017 by vancemorgan. Broken windows and empty hallways, a pale dead moon and a sky streaked with gray. Jeanne and I are television binge-watchers. A couple of years ago, our obsession was ABC’s “Scandal,” an addictive series about a Washington “fixer” trying to break off an affair with the President she helped get elected while descending for 47 minutes on a weekly basis into the depths of depravity, violence and dysfunction that we all suspect is daily fare in the nation’s capital. It does not match my favorites—“Breaking Bad,” “Homeland,” “Downton Abbey,” “The Wire,” “The Newsroom” and more—in quality of acting, production value, or award-winning writing; it’s just addictive entertainment. “Scandal” was in its fourth season when we discovered it, so we had a lot of catching up to do via Netflix. “Scarecrows dressed in the latest styles, with frozen smiles to keep love away. Human kindness is overflowing, and I think it’s going to rain today.” Wow. I don’t consider myself to be a dark person. Frequently ironic, sometimes sarcastic, often introspective, always introverted (except when I am getting paid to be extroverted in the classroom)—yes. But not dark. Yet darkness has been coming across my radar screen for several weeks in books, on television, in movies, on the radio, in the classroom—my inner sensibilities have become tuned sufficiently over the past few years that I now take notice of such “coincidences,” wondering if someone is trying to tell me something. I have never been able to hear “I Think It’s Going to Rain Today” dry-eyed. As a young teen I thought my emotions directly challenged my manhood-to-be; now I just think it’s because I’m a human being resonating with a beautiful, artistic expression of the sadness and loneliness that is just beneath everyone’s surface. Focuses on staying in the light of God around the clock, both absorbing and reflecting the sunny side of faith. You can usually recognize a full solar church by its emphasis on the benefits of faith, which include a sure sense of God’s presence, certainty of belief, divine guidance in all things, and reliable answers to prayer. The fact that our fervent prayers often went unanswered and the presence of the divine was often undetectable didn’t matter—we were urged to live out a religious version of “Fake it ‘til you make it” because, after all, how can you not be happy when you have everything right and God is on your side? Unfortunately I was not gifted with a full solar personality—I guess my resonance with tunes like “I Think It’s Going to Rain Today” is direct proof. I am more of a lunar than solar person, preferring the reflected light of Artemis and the moon to the solar splendor of her twin brother Apollo. Tolkien’s lunar elven queen Galadriel is my favorite character in The Lord of the Rings. And I found in Barbara Brown Taylor’s description of her own spiritual orientation something very familiar. I have been given the gift of lunar spirituality, in which the divine light available to me waxes and wanes with the season. . . . All in all, the moon is a truer mirror for my soul than the sun that looks the same way every day. I heard on NPR not long ago that on the eve of the conclave that would elect him as the next Pope, then Cardinal Jorge Mario Bergoglio urged his fellow cardinals to remember that Christians should live by the light of the moon rather than of the sun. Followers of Christ should reflect the source of light rather than acting as if they are the source. With regard to the hierarchy of the religious structure he would soon be elected to lead, he said that the church exists to reflect Christ—as soon as it believes it itself is the light, disaster occurs and the church becomes an idol. Preach it, Francis. Five words I thought I’d never say: I really like this Pope. While there might be many reasons to fear the dark, times of darkness are part of being human and spiritual darkness is central to a search for the divine. The way many persons of faith talk about darkness, you would think that it came from a whole different deity, but as Barbara Brown Taylor reminds us, “to be human is to live by sunlight and moonlight, with anxiety and delight, admitting limits and transcending them, falling down and rising up.” The final lines of Randy Newman’s lyrics shine a pale light into an often dark world: “Right before me, the signs implore me—Help the needy and show them the way. Human kindness is overflowing, and I think it’s going to rain today.” Here is Peter Gabriel’s version—I dare you to have dry eyes at the end. This entry was posted in books, certainty, Christianity, faith, family, God, human nature, Jeanne, love, movies, music, mythology, NPR, suffering, television and tagged Barbara Brown Taylor, Christianity, Jeanne, music, Tolkien on March 29, 2017 by vancemorgan. During the early years of my career I developed the habit of teaching at least one overload course per semester in my college’s evening program. The immediate reason for taking on the extra course was entirely mercenary—new professors don’t make a lot and we needed the money. Teaching in the evening school—it’s called the School of Continuing Education (SCE) at the college where I have taught for the past twenty-one years—provides unique challenges. The typical evening course has an eclectic group of students, ranging from day students who either are trying to earn an “easy” three credits or are making up for an “F” the previous semester to adult students who are earning an associates or bachelor’s degree one course at a time, a process often stretched over many years. I particularly love teaching adult students, grown-ups with life experience who often are either making great personal sacrifices returning to college after many years or who are in their fifties or sixties (or older) taking their first college course. Such students seize ownership of their education in ways that eighteen to twenty year olds seldom do. They challenge, question, participate, keep the teacher on her or his toes, and inject life into even the most boring topics. I stopped teaching regularly at night a number of years ago for several reasons, but still miss my SCE students. I remember with particular fondness an introductory philosophy course that I taught many years ago in the SCE, so long ago that I no longer have the syllabus and lesson plans in my digital archives (the documents were probably written in WordPerfect). The twenty-five students were the usual grab bag, including five or six youngsters from the day school, a couple of ROTC officers, some secretaries and administrative assistants from various departments and offices across campus, and a guy who had just been hired by the college as a night shift security guard. Before I even met my students I decided that they would be guinea pigs as I chose to scrap earlier versions of the syllabus and do something new. A standard topic in introductory philosophy courses is “the problem of evil”—why do bad things happen to good people, if there is a good God why is there so much evil in the world, and so on. My intuition then (and now) was that a different angle on this stale set of questions was needed. What if we flipped the question on its head and asked where goodness comes from? After all, we are thoroughly familiar with the multitude of bad things that humans do and that happen to them. Instead of spinning our collective wheels there, why not investigate the phenomenon of goodness? How does goodness happen in a world where bad things grab most of the headlines and air space? I called the course “The Problem of Goodness,” and we were off. Various suggestions were offered, but I have never forgotten an idea contributed by one of the ROTC officers sitting in the back. “It seems to me,” he said, “that Goodness is perpetuated by individuals while evil, more often than not, is perpetrated by groups.” Such sweeping generalizations are always open to counter-examples, but at the time the students agreed that our studies that semester supported the conclusion. I have frequently returned to this thesis over the fifteen or more years since our “The Problem of Goodness” class, most recently in a colloquium I am currently teaching for the third time with a colleague from the history department called “Love Never Fails: Grace, Truth, and Freedom in the Nazi Era.” In this focused investigation of goodness in the context of evil, the conclusions drawn by my students have been remarkably similar to those drawn by my students almost two decades ago—goodness is sparked by individual commitment—what is committed to is less important than the requirement that individuals must be willing, often contrary to powerful collective forces, to risk a great deal–even one’s own life—in the pursuit of goodness. Edmund Burke famously said that “All that is necessary for the triumph of evil is that good men do nothing.” In order, however, for this to be more than just another platitude we need to ask exactly what is required for good people to do something. It is one thing to rail against the failure of individuals to resist the collective power of evil, but it is another to specify what is needed for people to act. Two years ago, in the final seminar of my “Love Never Fails” colloquium, I gave my students the following assignment: Based on what we have learned, suppose that we wanted to write a handbook or guide for future generations on how to preserve and perpetuate goodness in the midst of evil. Are there common techniques or skills that the people we studied this semester invariably relied on as they responded to evil? Here, in no particular order, are some of my students’ suggestions concerning how to preserve one’s character and integrity in the face of severe challenges. Some things are more important than life. I have often asked students over the years “what things are worth dying for?” more or less as a thought experiment. But for the people we studied, this was not an academic exercise. Just as Socrates sharply drew a contrast between “living” and “living well” more than two millennia ago, my students and I encountered a series of counterexamples to the notion that self-preservation trumps everything else. In a variety of ways, those who responded to evil demonstrated that some things are more important than guaranteeing ones continuing survival. As Socrates argued, some lives are not worth living. A life preserved by refusing to do whatever one can to resist evil is one of those lives. Look toward the other: One of the most important keys to preserving goodness in the presence of evil is the ability to focus my attention on something other than myself. Iris Murdoch defined love as “the extremely difficult realization that something other than oneself is real.” There is no greater technique for escaping the iron grasp of ego and self-centeredness than cultivating a sharp awareness of the reality of what is not me. Perhaps the most remarkable feature of these common techniques is their shared accessibility. Self-knowledge, simplicity, the ability to recognize what is truly important, spiritual awareness, courage—these are not magical moral weapons available only to saints and heroes. I can do this. You can do this. But only if we start now. Good habits can only be developed through repetition; we only become skillful wielding the weapons of the spirit through practice. Let’s get started. This entry was posted in Angels, belief, evil, God, human nature, literature, movies, philosophy, Providence College, stories, suffering, teaching and tagged angels, God, philosophy, Providence College, teaching on March 10, 2017 by vancemorgan. This has occasionally subjected me to a certain amount of push back from my Catholic friends, but I’ve stood firm by my attitudes and arguments. But over the past couple of weeks, my lovely Jeanne and I have had an ongoing conversation about Lent that has caused me to start rethinking my anti-Lenten attitudes. working as a Minister of Music, falling in love with two seminarians at different growth phases (and winding up with a philosopher) and finally leaving the Roman tradition for a simple relationship with the Father, Son and Holy Spirit (or as she likes to call the Holy Spirit, Big Bird). I know both of these seminarians, and am thankful they both had the good sense to choose the church over the love of my life—it would have been awkward when I met her thirty years ago if she had been married to one of them. Jeanne calls this “Brooklyn spirituality,” which is about as far from my own type of spirituality as one can get. Still, one of the reasons our three-decade union of opposites has worked is that we respect the importance and value of each other’s very different attempts to figure out what the divine is up to. With allowance for my obvious bias in favor of anything Jeanne says, this is a profound insight. My problem with Lent has always been that it provides an opportunity for “spirituality on the cheap.” Anyone can give something up for forty days, especially if it produces a false sense of spiritual satisfaction. Jeanne’s insight is that I have this all wrong (a point she makes frequently to me). Lent provides an opportunity to deliberately do something that all of us regularly neglect: Taking care of and loving ourselves as if we mattered. Because we do. To wrap up, Jeanne—as is her custom—got direct and honest. “To flesh this out, Jeanne has battled with food since birth, or at least that’s how it seems. Her latest struggle is with diet drinks, coffee—which is her favored delivery system for sugar substitute and cream—and alcohol! She loves her vodka. About as much as I love single malt scotch and dark beer. They are not good for her soul. These are good decisions–plus, this means that for the next forty days Jeanne won’t be drinking any of my dark beer. On this Ash Wednesday, the Lenten question for each of us is not “What should I give up for Lent in order to feel deprived, and therefore more spiritual or holy?” The question rather is “Do I dare treat myself as if I matter?” or “Am I willing to risk seeing myself as valued and loved in the manner that God sees me?” If the answer to this is “yes,” then what are the ways in which I habitually treat myself as if I did not matter? Am I willing to deliberately suspend those activities, even for a limited time? Am I willing, with Big Bird’s help, to take on a new Lenten experiment—loving myself? This entry was posted in beauty, Big Bird, Catholicism, Christianity, Episcopal, extroverts, faith, God, Holy Spirit, human nature, Jeanne, Jesus, liturgy, love, movies, music, philosophy, teaching and tagged Big Bird, Christianity, faith, family, God, Jesus, Lent, philosophy on March 1, 2017 by vancemorgan. Jeanne and I are great lovers of movies. As I have described in this blog on several occasions, my all-time favorite movie is “Dead Poet’s Society;” Jeanne’s is “Chariots of Fire.” But a different movie that appears on both of our “top ten” lists—a movie that I am thinking of frequently these days as politicians seek to attract the attention and support of the good citizens of the heartland—is “Field of Dreams.” The story is familiar to most everyone—pure magic with Kevin Costner, James Earl Jones, Burt Lancaster and Ray Liotta in an Iowa corn field. Toward the end of the movie, as Ray Kinsella begins throwing a baseball with his father who died years earlier and who Ray had rejected long before that, John Kinsella asks “Is this heaven?” “No,” Ray replies—“It’s Iowa.” Every four years, Iowa is a place where the dreams of Presidential hopefuls come either to die or to live until the next primary, but the Iowa of “Field of Dreams” is a place where, at least for a time, the dividing line between this world and what lies beyond is blurred. One man, rushing by with a few colleagues on his way to a meeting a few blocks down the avenue, upon seeing her distress stopped and came back. “Go on—I’ll catch up with you!” he shouted to his companions. He got down with the young woman on the sidewalk and started retrieving what produce he could. It was only then, as he watched her sweep her hands across the sidewalk in every direction with her face pointed upward, that he realized the young woman was blind. “What am I going to do?” she kept crying. Chittister doesn’t reveal the man’s answer to the question, but I know what mine would have been. Assuming, of course, that I had been good enough to stop and help the woman while hurrying from one place to another. I’d like to think that I would have helped, but the truth is that Jeanne is far more likely to have immediately gotten on her hands and knees to help and would have dragged me down to do so as well. My answer to the “are you Jesus?” question would have been first to laugh, then say something like “no, that’s well above my pay grade!” The blind woman’s question is understandable—this is the sort of thing that one can imagine Jesus doing, regardless of whether one is a Christian— but we forget that all we have of what Jesus was like are vignettes, bits and pieces of the sorts of things the guy and his entourage were up to for three years as they wandered the countryside and towns. It is very possible, though, that the gospels are a “greatest hits” sort of account; stories of the undoubtedly many times Jesus walked by someone in need or failed to recognize a person in distress aren’t likely to sell very well or generate many followers over the generations. But even in the gospels we occasionally catch glimpses of Jesus in a hurry, Jesus worn out by the crowds, and Jesus having a bad day. 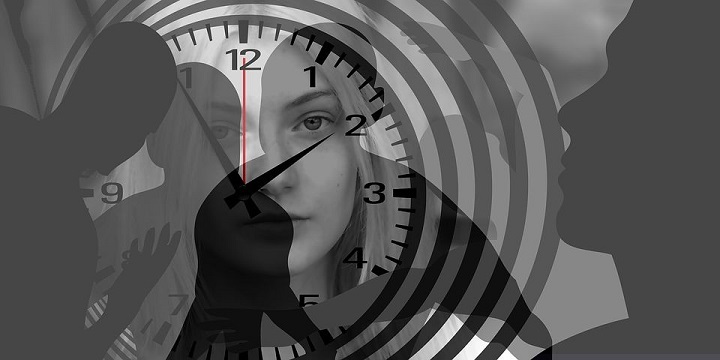 The young woman’s “Are you Jesus?” question is not inspired by a miracle performed or an eloquent sermon delivered—she asks because the man who helps is doing the sort of thing that human beings do when they are at their best rather than in a rush, self-absorbed, or unaware of what is right in front of them. In her mind “Jesus” is the name for the best that a human being can be. That is definitely not above my pay grade. Within the context of my Christian faith, helping those in need is not only within my pay grade, it is according to the gospels a requirement of my faith. According to the texts, the one guaranteed way to piss God off is to fail to pay attention to the poor, widows, homeless, orphans, and all those who have fallen through the cracks. To be a follower of Jesus is, by definition, to be a person who is on the front lines of aid and protection for the less fortunate. T his is more than a moral directive—it is the direct outcome of the Christian story of Incarnation. God in human form, the divine clothed in mortal flesh—this is the heart and soul of the Christian faith and it how God continues to be present and work in the world. God made flesh is not just a moment in time that we celebrate two millennia later. As Chittister points out, the created world in which we live can only be completed when we take ownership of the divine within us and act accordingly. God did not finish creation; God started it. Its ongoing development God leaves to us. What we do in life makes us the hands of God in living flesh and blood. Having made the world, having given it everything it needs to continue, having brought it to the point of abundance and possibility and dynamism, God left it for us to finish. God left it to us to be the mercy and the justice, the charity and the care, the righteousness and the commitment, all that it will take for people to bring the goodness of God to outweigh the rest. Are you Jesus? people ask us silently every day. 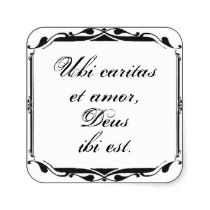 And the answer formed in us if we live it with constancy, with regularity, with fidelity, is surely, yes. This entry was posted in Bible, books, Christianity, faith, heaven, incarnation, Jeanne, Jesus, miracles, movies, suffering and tagged Christianity, faith, Jeanne, Jesus, Joan Chittister on January 23, 2017 by vancemorgan. I n the interdisciplinary program I teach in and used to direct, the first semester faculty have to make many tough choices. Iliad or Odyssey? What texts from the Hebrew Scriptures? The New Testament? What to use from Plato and Aristotle–or, God forbid, Plato or Aristotle? And no less challenging—which of the triumvirate of great Greek tragedians? Usually it is a toss-up between the profundity of Sophocles and the brilliance of Euripides, but last fall my teammate and I opted for the first of the trio, Aeschylus. We spent a week with sixty-five freshmen in The Oresteia, a trilogy with enough violence and dysfunctional family intrigue to hopefully satisfy the most scandal-hungry eighteen year old. Perhaps some of the playwright’s profound insights into the human condition seeped in as well. comes wisdom through the awful grace of God. I was reminded of both Dr. King and Bobby Kennedy , as well as these lines from Aeschylus as I was listening to “The Moth Radio Hour” on NPR the other day. One of the story-tellers at the Moth event was Sala Udin who told of how as a Freedom Rider in Mississippi fifty years ago he came within an inch of losing his life after being stopped and then viciously beaten by the Mississippi State Police. In his jail cell, as he looked at his battered and disfigured face in the mirror, he thought “I don’t know why they didn’t kill me, but they should have. Now I’m committed. I’m clear. I will never stop fighting racism and injustice. I’m going to be a Freedom Rider for the rest of my life.” Udin and thousands like him were some of those drops upon the heart that Aeschylus wrote of over two millennia ago. Because of persons like Udin, change in the direction of wisdom incrementally but inexorably comes “against our will,” a change that although real is nowhere near complete. I was born in 1956 and was too young to be directly involved in the early days of the Civil Rights movement, but have often wondered whether I would have wanted to be a Freedom Rider if I had been old enough and had been given the opportunity. I have no reason to believe that I would have, but take a small amount of comfort in the belief that once the habit is developed, courage tends to be available in the amounts needed by present circumstances. I have never been faced directly with the question of what I would be willing to stake my life on and possibly die for, but can at least hope that faced with the decision to act on what things are worth risking or even losing my life for, I would not immediately run away. Jeanne and I recently watched one of our favorite movies—”Amazing Grace”—with a good friend who had not seen it before. The 2007 movie includes fine acting performances from various rising young actors who now are the hottest performers going—Ioan Gruffudd, Benedict Cumberbatch, Rufus Sewell, Romola Garai—the wonderful Ciaran Hinds (who knew that Julius Caesar was in the House of Commons? ), and two of my favorite older actors, Michael Gambon and Albert Finney. “Amazing Grace” is the story of William Wilberforce’s twenty year campaign to end the slave trade in England, finally accomplished in 1807 (the movie is a celebration of the bicentennial of that legislation). I have no idea how historically accurate the movie is, but as my good friend and colleague Rodney used to say, if it isn’t true it should be. It’s a great story. In the middle of their conversation, Newton mentions he has heard that Wilberforce is returning to the faith of his youth; Wilberforce confirms the rumor, but says that while he badly needs divine inspiration and help, there have been no inspirational lightning bolts thus far. “Ah,” replies Newton, “but God sometimes does his work through gentle drizzle rather than storms.” It is many more years before Wilberforce and his supporting cohorts from all walks of life land on a strategy that finally works, confirming Newton’s insight. The frontal attacks of previous years, energized by righteous anger, eloquent statesmanship, and the best of moral intentions have failed again and again. It is not until an obscure lawyer in Wilberforce’s entourage of like-minded persons suggests a new strategy—essentially “we cheat”—that success is finally won. Through behind the scenes manipulation and the use of a long neglected, virtually unknown set of maritime regulations, Wilberforce does a brilliant end run on his political opponents and slavery in Great Britain soon crumbles under its own weight. It will take more than another half century and a brutal Civil War for the same to happen in the United States. God sometimes does his work through gentle drizzle rather than storms. Ain’t it the truth? That certainly has been my experience, both in my own life and as I have observed the world around me for more than six decades. In its Latin roots, to “convert” means to “turn around,” but this turning is more often like a sunflower following the sun in its slow course across the sky than a dynamic and once-for-all event. I am an optimist at heart, something that is often difficult to sustain when I think about how much there is to be accomplished in my own life and in the world around me. But a steady rain, even a gentle drizzle, is better for my plants and grass than an inch-in-a-half-hour downpour. Beneath the layers of violence, hatred, ignorance and despair, something holy is lurking. Let the gentle drizzle and drops upon the heart release it. This entry was posted in books, Christianity, Development of Western Civilization, faith, flowers, God, grace, history, justice, literature, movies, music, NPR, philosophy, politics, teaching and tagged Aeschuylus, Christianity, Development of Western Civilization, Dr. Martin Luther King, faith, God, grace, Robert Kennedy on January 16, 2017 by vancemorgan. Each week for the past many years, Garrison Keillor has told “Prairie Home Companion” listeners the news from Lake Wobe gon, where “all the women are strong, all the men are good-looking, and all the children are above average.” I’ll bet the Holy Family was like that. Lots of people think their children are well “above average”—hence, the bumper stickers in which parents boast that they are the “Proud Parents of an Honor Student at _________.” Everyone thinks their child is precocious and the smartest/best looking/most creative human being ever. Every parent expects their infant to earn either a full academic or full athletic scholarship (probably both) to the college of their choice when the time comes. I doubt there is a place for a bumper sticker on a donkey, but if there is, what would Mary and Joseph’s donkey sticker have said? “Proud Parents of the Savior of the World”? “Our Kid is God in the Flesh”? Because there’s precocity, and then there’s precocity. In “The Nativity Story,” a significant amount of time is spent on Mary and Joseph’s journey from Nazareth south to Bethlehem. The filmmaker creatively lets us spend some time with these two young people, almost strangers to each other, who have been named as players in a divine plan that they have been told very little about. At one point, Mary asks Joseph what the angel had said to him. Joseph: He said to not be afraid. (pause) Are you afraid? Mary: Do you ever wonder when we’ll know? That he is not just a child? Something he says, a look in his eyes? Joseph: Sometimes I wonder will I be able to even teach him anything. No kidding. When it is predicted by the angels that the soon-to-be-born baby will “save his people from their sins,” one’s possible parental and step-parental contributions certainly seem to pale in comparison. Although you wouldn’t know it from the mass quantities of commentary and artwork that have been produced over the last two thousand years, the canonical Gospels tell us remarkably little about holy family life. The non-canonical gospels, however, contain some stories that entirely corroborate Mary and Joseph’s pre-birth concerns. Jesus makes clay birds, which then come to life and fly away. Jesus strikes an annoying playmate dead. Jesus brings a less annoying playmate back to life after a fatal accident. School is a disaster, since every time a teacher tries to teach Jesus something, Jesus starts doing the teaching instead. Joseph and Mary’s worst fears come true. The canonical gospels essentially leave us in the dark about Jesus between birth and thirty years old. We get the circumcision, the three kings, the flight to Egypt, Jesus growing in wisdom and stature, and a central text from Luke 2, twelve-year-old Jesus in the temple. The various artist’s renditions I’ve seen of this story are pretty much the same— Jesus, looking particularly Aryan in the center of a holy glow, pontificates and astounds while his learned elders in the shadows lean away in disbelief and awe and some scribe takes notes. It’s kind of how I remember myself as a fifth or sixth grader, astounding (annoying?) my teacher and fellow students with yet another piece of fascinating (to me), but useless (to anyone else) information. Lovely scene, except that it has a lot more to do with what we think Jesus at twelve would have been like than anything from the story in Luke. The actual story gives us a glimpse into a real family, holy or not. After going to the feast in Jerusalem with friends and family, as is their annual custom, Mary and Joseph are returning north to Nazareth. Although they’re not sure where Jesus is, they assume that he’s running around with his friends somewhere in the traveling group, so they don’t worry about it. Good for them—he’s almost a teenager, and they’ve loosened the parental leash a little bit. Let the boy have some freedom. But when he doesn’t show up at the end of the day, they’re worried. After failing to find him in the caravan, they return in panic to Jerusalem, where after three days they find him in the temple “sitting in the midst of the teachers.” In response to his mother’s exasperated and relieved “What the hell is your problem?? We’ve been looking all over for you!!! We thought you’d been kidnapped!!! !”, Jesus gives a predictable, smart-alecky twelve-year-old response: “Why is it that you sought me? Did you not know that I must be about My Father’s business?” Oh really?? “Guess what? You’re grounded! Once we get back to Nazareth you can ‘be about your Father’s business’ in your room! !” Luke chooses not to tell us if Jesus then received a well-deserved slap upside the head and lived under house arrest for the next year. I don’t know whether twelve-year-old Jesus thought he was the Son of God—my bet is that he didn’t. But he did know where he wanted to be—he wanted to be where he could learn. 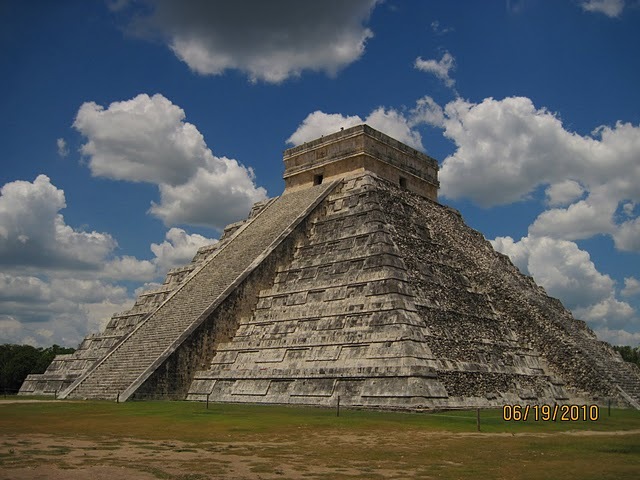 Certainly the mystery and splendor of the Temple would have been an attraction for any young Jewish boy. But the real attraction was that this is where learning happened. This is where the most intelligent and educated people of Jesus’ society gathered to debate, to investigate, to discuss, and to discover. And that’s where Jesus wanted to be—listening and asking questions. Even the Son of God had a lot to learn and knew how to get started. Put yourself in the right place and open yourself up. Reflecting on this will be a wonderful preparation for the upcoming semester. The life of learning is so much more about quietness, attentive listening, and perceptive questions than conveying facts and information. This is where the divine in each of our human vessels gets awakened and fanned into flame. It’s a privilege to participate. When, as always happens, I find myself buried under and frustrated by piles of grading and endless department and committee meetings in a few weeks, I’ll try to remember twelve-year-old Jesus, who knew where he belonged. He was about his Father’s business. Go and do likewise. This entry was posted in Angels, attention, Bible, Christianity, doubt, faith, family, friends, God, hell, humility, incarnation, irreverence, Jesus, listen, love, movies, mystery, teaching, wonder and tagged family, Garrison Keillor, Jesus, Prairie Home Companion, St. Joseph, the Holy Family, Virgin Mary on January 11, 2017 by vancemorgan.